BLOOMINGTON—In one way or another, the ministry of parish administrators of religious education and youth ministers across the archdioce is closely tied to the priests with whom they collaborate. So during this Year for Priests, the archdiocesan Office of Catholic Education invited these catechetical leaders to reflect on the priesthood during a winter business meeting held on Jan. 12 at St. John the Apostle Parish in Bloomington. 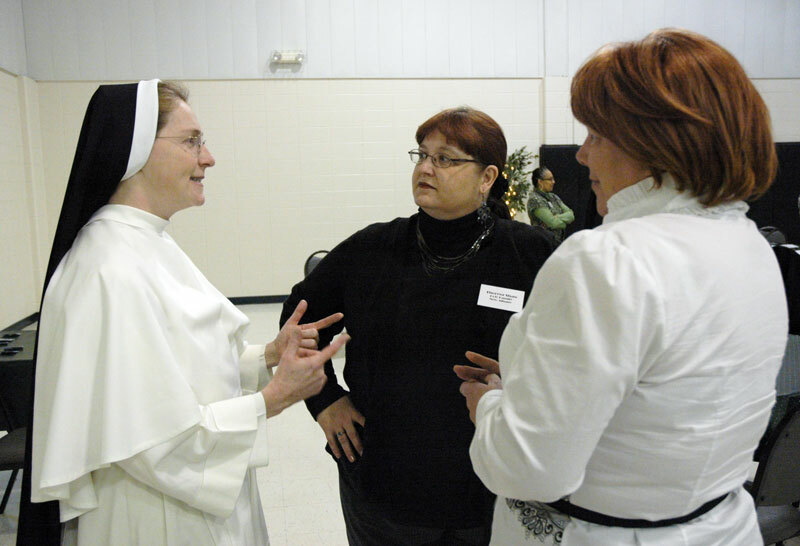 Dominican Sister Mary Michael Fox, director of the catechetics program at Aquinas College in Nashville, Tenn., spoke about the priesthood at the gathering. She is a member of the Nashville-based Dominican Sisters of St. Cecilia. Weaving together reflections on the Curé of Ars, St. John Vianney, and literary portraits of priests found in both Graham Greene’s The Power and the Glory and Georges Bernanos’ Diary of a Country Priest, Sister Mary Michael presented to her audience what is at the heart of the priesthood and suggested ways that they could support the priests with whom they work. Ultimately, a priest’s purpose is to continue Christ’s ministry of redemption and help the people he serves to grow in holiness, she said. “He does so simply because he is the instrument of the sacraments,” Sister Mary Michael said. “No priest, no Eucharist. No Eucharist, no sacrifice on Calvary. No sacrifice, no grace. No grace, no eternal life. She later explained that the Eucharist is the primary way that priests continue Christ’s work of redemption. “It’s unreasonable that God would go through all that trouble to send his Son and reconcile us to himself, and to not leave a way for you and I to have access to that reconciliation,” she said. According to Sister Mary Michael, a priest pours out his life for his parishioners in his sacramental ministry just as Christ died for us on the cross. Sister Mary Michael said that the confusion about the nature of the priesthood in the minds of some people in the Church and in the broader society is ultimately rooted in misunderstanding the identity of Christ and his saving mission. Sister Mary Michael suggested ways that catechetical leaders could support the priests in their parishes. One way was to invite priests to carry out their sacramental ministry in their religious education programs by hearing confessions, presiding over eucharistic holy hours, and leading children or adult students in prayer. Some catechetical leaders might hesitate to do this because they feel that their priest is overworked, and they don’t want him to get burned out, she said. Therefore, she also advised her listeners to not feel the need to invite their priest to come to all catechetical planning meetings. Luci Welch, the coordinator of religious education at St. Anne Parish in New Castle in the Connersville Deanery, appreciated the presentation. Christa Dohmen, the director of religious education at St. John the Baptist Parish in Dover and St. Joseph Parish in St. Leon, both in the Batesville Deanery, said the presentation will help her encourage the children in her religious education program “to pray for our priests and also see what the priesthood really is because there’s such a confusion out there.